An outstanding new release from the prestigious Royal Canadian Mint, the 2017 Special Edition 1oz 150 Voyageur Silver Coin celebrates 150 years of the Federation of Canada in fine .9999 silver. Coins are often used to illustrate the integrity and character of a nation and no coin does it for Canada as well as the voyageur silver dollar. Find the best prices online with coininvest.com and add a unique coin to your collection today. Canada's first circulating silver dollar was introduced in 1935 to mark the Silver Jubilee of King George V. Its reverse featured the iconic 'Voyageur' image created by acclaimed Canadian sculptor, Emanuel Hahn – a design that proved an instant hit and was little changed over the years. The new Special Edition 2017 1oz 150 Silver Voyageur is identical to the 1935 coin and features a Voyager and his guide aboard a canoe loaded with furs to trade – look closely and you'll see that the bundle is marked 'HB' for the Hudson Bay Company. A pine-forested island can be seen in the background, evoking all the possibility and abundance of the unexplored wilderness. The coin's reverse also carries the Royal Canadian Mint's famous maple leaf security motif and a 150-year marker against a background of precision-cut radial lines. The obverse of the 2017 Silver 1oz 150 Voyageur is graced with Susanna Blunt's portrait of HM Queen Elizabeth II along with the silver coin's year of issue and its denomination – at $5, it's the highest made available for a legal tender silver 1oz bullion coin. 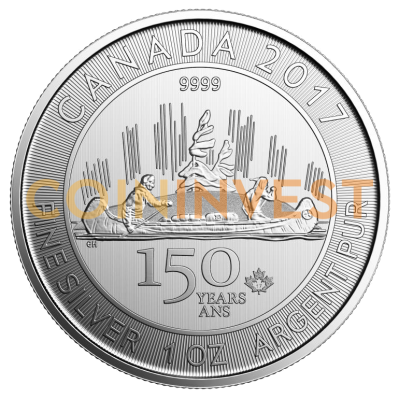 CoinInvest is delighted to present the Special Edition RCM 2017 1oz 150 Voyageur Silver Coin. Order today to avoid disappointment - with production limited to just 250,000, demand for this striking Special Edition silver coin will be high!